Scripture reading is an important spiriutal discipline in my life. There are seasons when I long for in-depth Bible study and there are seasons when I long for more of a meditative style scripture reading. The first approach is informational, the second is formational. Both are important on the spiritual formation journey. Lectio Divina is the style of reading scripture I enjoy most regularly. Clearly, it is one of my favorite ways of spending time with God as my new devotional Holy Listening with Breath, Body, and the Spirit includes 40 different selections for Lectio Divina (latin for meditative reading). It's a fairly simple way, yet also very transformative, to spend time in scripture as you read and reflect on how the scripture touches you. You read, reflect, respond, and rest in God's word. But, where do you start and how do you select a passage if you don't have a guide in your hand? In this season of life, my time in scripture follows the lectionary (a 3-year cycle of readings throughout the old and new testament). There are two main tools I use as my guide for following the lectionary. The first one is published by Upper Room Books each year,Disciplines 2017. This in-depth little book is loaded with deep yet also brief daily thoughts from 52 various writers. Each week the writers reflect on the weekly lectionary passages and invite you in to deeper reflection and study. I have turned to Disciplines over the years (for my personal study and for leading small groups). This year, I am truly humbled to be included as one of those 52 writers in the 2017 edition and I ook forward to journeying with these thoughts throughout the year. Next up, and newest to my spiriutal formation tool kit, is the Sacred Ordinary Days Planner. This planner includes the current lectionary passages for the week and follows the liturgical year. The liturgical year is also known as the Christian Year. It includes all the seasons of the church (lent, advent, easter, etc.). If you're new to discovering the rhthym of the liturgical year and long for a community of resources, check out Sacred Ordinary Days! My friend, Jenn Giles Kemper, is the founder of this soul-stirring company (you can check out the new calendars at the link below). 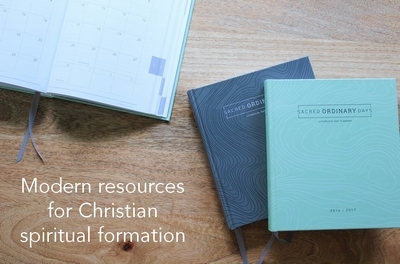 Sacred Ordinary Days now offers weekly and monthly formatted planners for your year and include much more than simply a guide to the liturgical calendar. Great for personal reflection and for daily planning. Check them out! It is with Lectio Divina, the Lectionary, and embracing the Liturgical year that I discover the rhthym I long for in a new calendar year. How do you plan to spend time in God's word in 2017?